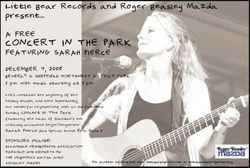 Come join your friends and neighbors on Sunday, December 7, 2008 for a free concert in the park with Sarah Pierce. This should be a thoroughly enjoyable and relaxing way to kick off the holidays. 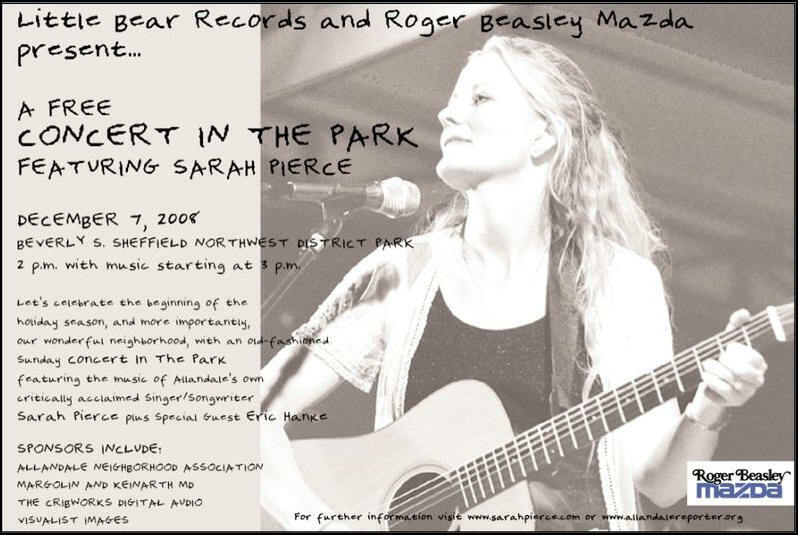 Sarah is an accomplished singer/songwriter (www.sarahpierce.com) just coming off a tour in Italy. Roger Beasley Mazda is the primary sponsor of the event. Eric Hanke will be the opening act, (www.erichankeband.com). Amy's Ice Cream will be there as will Russell's Bakery. In addition to ice cream, Amy's will be serving their new Belgian Hot Chocolate with homemade marshmallows. The concert will be outdoors at Northwest Park on the hillside adjacent to the playground. Music starts at 3:00. Sarah is an Allandale resident recently profiled in the Allandale Neighbor. Come join your friends and neighbors for this FREE event.